Rudolph Michael Schindler, born Rudolf Michael Schindler, radically changed the landscape of residential architecture in Los Angeles. During his studies at the Bau-(Architektur) schule of the k.k, the Technische Hochschule (Polytechnic Institute), and the k.k. Akademie der bildenden Künste (Academy of Fine Arts) professors Carl König, Otto Wagner, and Adolf Loos conceptually laid the groundwork for Schindler’s contribution to modern architecture. However, it was the work of Frank Lloyd Wright published in the Wasmuth Portfolio that proved most influential. Schindler ended up working for Wright on the Imperial Hotel in Japan. During this time he traveled to Los Angeles to supervise one of Wright’s most important American commissions, the Hollyhock house for oil heiress Aline Barnsdall. Schindler coined his style of modern architecture, “Space Architecture,” which focused on the design of interior space. His personal residence known as the Schindler House, aka the Schindler Chace House, or Kings Road House located in West Hollywood, California, tested his interior concepts and was possibly the first modernist style home built in Los Angeles. It was designed as a cooperative live/work space for two young families. The LADBS initially denied Schindler a building permit because the notion of not including a conventional living room, dining room or bedrooms proved to be too radical of a concept. He was eventually able to convince the LADBS otherwise. About 150 of Schindler’s designs were built. 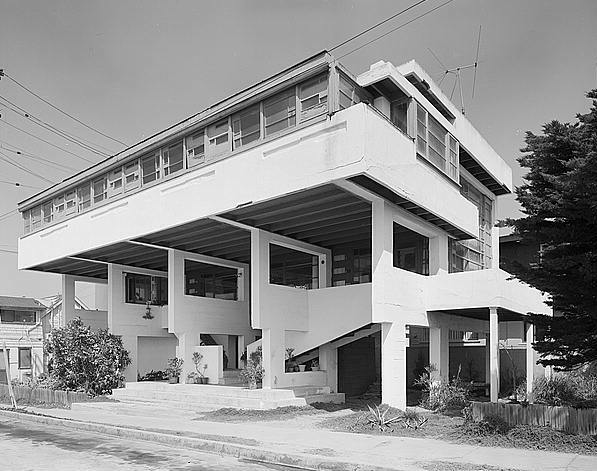 While largely a collection of single-family homes that include the How House in Silver Lake and the Lovell Beach House in Newport Beach, his work also included the Manola Court apartment building for Herman Sachs, in Silver Lake and the Bethlehem Baptist Church, on Compton Avenue in Los Angeles. To find a home designed by Schindler and other modernist architects visit mid-century modern homes for sale in Los Angeles.